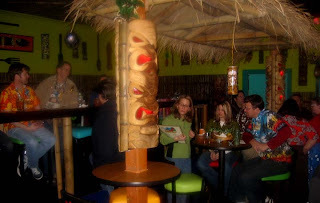 Hulahula opened last week and I visited it with Poi Polloi last night. It is adjacent to Tini Bigs martini bar and under the same ownership. It's fairly spacious and has a generous amount of bamboo, thatch, and Witco-like bas reliefs. The dance floor of the previous venue now features lounge chairs and a blacklight tiki mural that runs the length of the room. The drinks were mediocre, I had a below average mai tai and a worse pina colada before we had better luck with a navy grog and some punch type drinks (I watched the bar tender refer to the instructions to make some of them). Poi Polloi was very pleased with his appetizer, a shrimp, bacon, and hot pepper combo. I think they've done a fairly good job on the decor -- it's much more seriously devoted to tiki than any Seattle establishment except the Luau. It did feel a tiny bit sterile -- e.g. the wall decorations were too evenly placed, rather than giving the sense I like in a bar that the decorations have been slowly accumulating over many years. The bartender was friendly, but the place had very few patrons when we went -- granted in the dead week between Christmas and New Years. I'd like to see what the ambiance is like when it's more full. It's well worth a trip for any locals or visitors to the area, though you may have to go soon if business doesn't pick up considerably. For me it's a very welcome addition to Seattle's tiki world. My arm is in this photo.